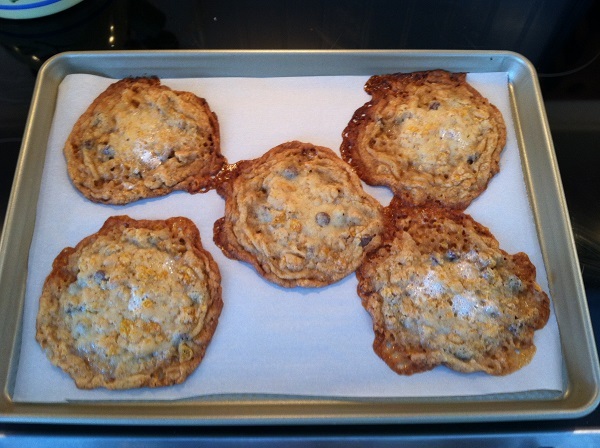 I saw this recipe for Cornflake Marshmallow Cookies on the Shutterbean blog and knew I just had to make them. 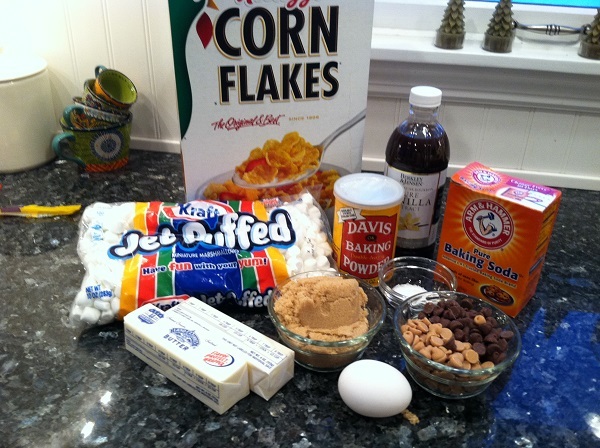 Besides Cornflakes and marshmallows, they have peanut butter chips and chocolate chips. How can you go wrong? I’ll tell you how – having crappy cookie sheets. Luckily I did have some success and they are really, really, really yummy! See how I did that semi-ying-yang thing with my chips? Food styling at it’s best. This recipe makes 12 humongous cookies. After mixing up the dough, you scoop it onto a cookie sheet with an ice cream scoop, press down the domed tops and refrigerate them for at least an hour and up to a week. Mine were in overnight. So, here is where I may have started going wrong: I think I pressed the tops down too much, making them spread more. I’ll give you a batch-by-batch play-by-play. These actually looked pretty good, although maybe spread too much. 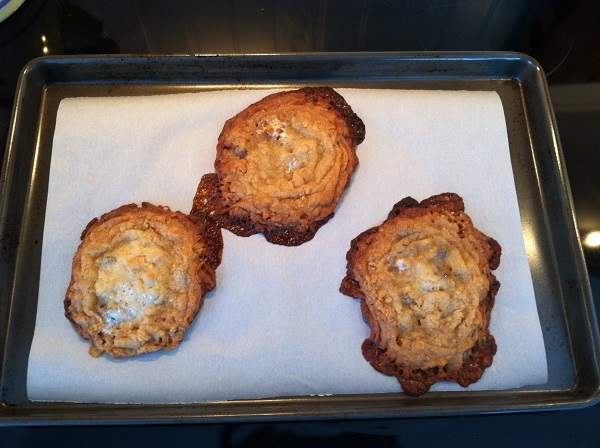 Second batch: Not as expensive but not cheap Wilton brand non-stick, dark cookie sheet…. Too-done edges. Maybe because it’s dark. 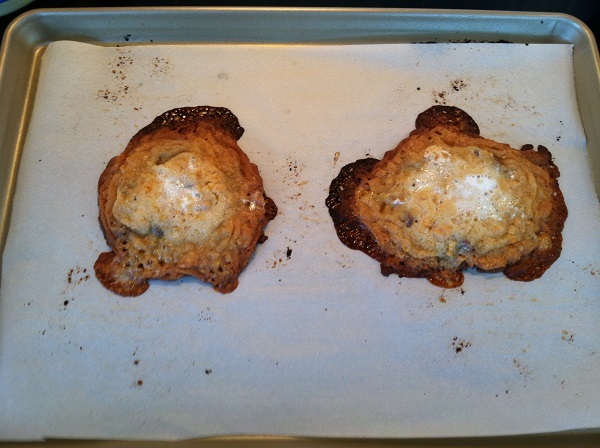 Third Batch: Cheapo, no-name cookie sheet…. Fourth Batch: Back to the Williams-Sonoma brand…. Edges too done but middle less spread. By this time, I think maybe my oven got a little hotter too. Or I was afraid the middle wasn’t cooking because they weren’t spreading as much as the others so I cooked them too long. Tracy’s (Shutterbean.com) looked so much better. No weirdo edges. Nice, round, even thickness cookies. By the way, I love Tracy’s blog. She makes yummy food and takes wonderful photographs. Check it out! 1) Use the fancy schmancy sheet. It really did the best job. I was trying to save time since you have to cool the cookies completely on the cookie sheet when they are done. 2) Push the tops down less? Maybe? 3) VERY YUMMY cookies! 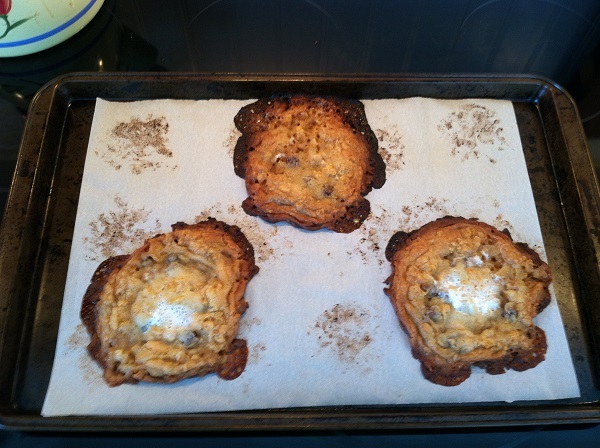 They were not perfectly round and the edges got burned but I broke off the too-done edges and the rest was delicious. Crispy, buttery, chewey-marshmallowy, chocolately, peanut buttery. So. Good. The best cookie I’ve had in a long time. 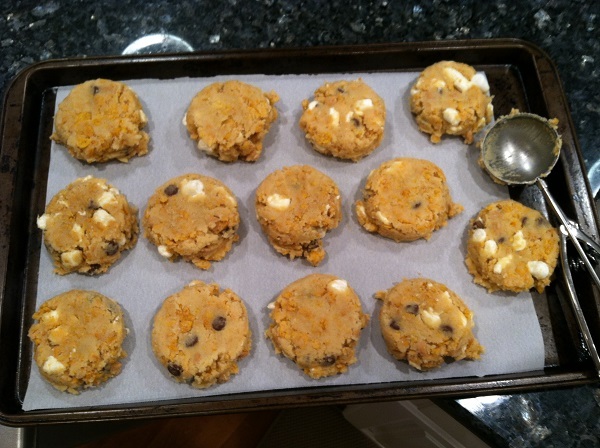 Posted in Uncategorized and tagged baking, cookies, cornflake marshmallow cookies, shutterbean on January 27, 2014 by lizytish. They sound good, you have a lot of patience! Great job on your projects I’ve seen, can’t wait to see the Downton Abbey shawl when its done / love that last kids hat you did with the tassel. forgot to comment on that one. Thanks Annette! The cookies were yummy and that hat was so adorable, I made an adult one too!